I really liked this! I confess that I was worried that I would not - I got a free copy of this in return for a fair review, and that always make me nervous, because what if I hate the book, right? Crisis averted! Life Unworthy starts out rather slow, which is a strange thing for me to say since it starts out with a very violent breakout from the Birkenau gas chamber. So blood and guts everywhere, but these are Nazi prison guards, so do we really care, right? 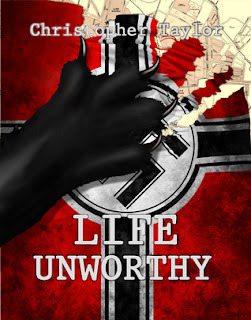 The author describes the scene, the setting, the action, in a literary style, and we start to get sucked into the oppressive and desperate era that is Nazi-occupied Poland. The characters start becoming individuals, with distinct motivations. They're not just Nazis in lock-step - they've got their own goals and agendas. Some justify themselves with Nietzsche, some just want the next promotion. The werewolf is a true monster, but he's also complicated. We meet the pretty Polish widow, a Romani with secrets. Then there's the weird Romanian guy with a leather trilby over his bald tatted scalp. They're interesting. Then things get really exciting. I don't think this is a series, which is a shame, because I'd love to read more stories set in this universe. Recommended for readers who like well-researched historical thrillers, gothic horror, monster hunts, characters who grapple with philosophical and moral questions. Available on Amazon in both Paperback and Kindle.